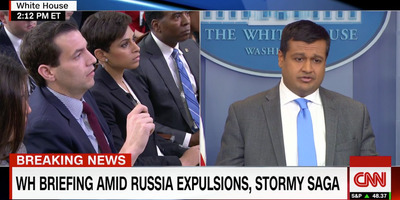 Screenshot/CNNZeke Miller and Raj Shah at Monday’s briefing. A reporter asked the White House deputy press secretary Raj Shah on Monday whether the administration could be trusted, as some of its recent claims, including denials of personnel changes, have turned out to be inaccurate. “Why should we in this room – and more importantly, the American people – trust anything this administration is telling them?” said Zeke Miller of The Associated Press. Shah insisted the White House always provided “the most accurate information” available at the time. There was little beating around the bush during Monday’s White House press briefing. 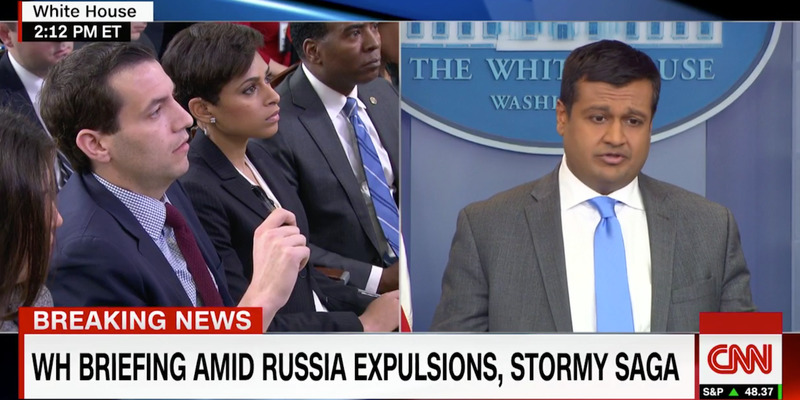 To start, the Associated Press reporter Zeke Miller asked the deputy press secretary Raj Shah to explain why Americans should believe what the White House says. Miller brought up a few recent instances in which the White House said things that were quickly determined to be untrue. He mentioned the president’s recent claim before his top lawyer resigned last week that he had full confidence in his attorneys, and Sarah Huckabee Sanders’ statement denying reports that H.R. McMaster was on his way out as national security adviser. “Why should we in this room – and more importantly, the American people – trust anything this administration is telling them?” Miller asked. Shah responded matter-of-factly, insisting the White House provides reporters – and by extension, the public – with “the most accurate information” it has at the time.